It's been a marvelous, glistening winter so far in Venice, hasn't it? There is no better place to realize this fact than at the beach each morning. We exchange smiles and waves with the regular people every day, all of feeling extra blessed/blissed, seen clearly on our faces. Yesterday's glorious stroll was interrupted by total mayhem. The tractor sand mover things were out rumbling the ground beneath our feet, super noisy. This is a harbinger of spring, however, as they were plowing down the giant sand berms that protect the homes in winter. So bad/good. Then the most gigantic yacht I've ever seen was parked out a little beyond the Venice Pier, belching smoke out its stacks and demanding to be gawked at. Obnoxious. (It's still there). Heading back north, we were just about to cross under the Venice Pier when a LAPD chopper began flying low out toward the yacht. Were they terrorists? Were they drug kingpins? What was going on?! Then cop cars began FLYING down the Venice pier, scattering pedestrians and fishermen as they sped past. I've never ever seen this before, and it was kind of alarming. Cops spilled out of their cars at the end of the pier, and we watched from the sand as a body jumped into the water. It was like watching the movie Falling Down. The cops and the people lining the pier all stared down into the water as LAPD and Lifeguard boats sped to the scene, Firetrucks wailed their arrival, and stand up paddle boarders rowed up to get a better look. Through it all, the surfers kept surfing. I hope the elderly gentleman is ok, that his people have shown up to love him, and that he can find peace and privacy. I also hope we can all cool it with the overreaction to stuff these days, and save the drama for the big stuff. Never a dull moment, Venice. There might not be a better place in the whole world for perfect chocolate than Jin Patisserie, and I can walk there. Serving up the most exquisite pastries and gorgeous, delicious chocolates since 2003 on Abbot Kinney, Jin is a true local treasure. Kristy Choo was born and raised in Singapore. She always loved to bake (me too! ), but craved travel and adventure (me too! ), so never really saw herself working in a kitchen. She became a flight attendant to satisfy some of her wanderlust, but kept thinking about what she truly loved to do, and that was to create wondrous dessert delights. To that end, Choo decided to attend the California Culinary Academy in San Francisco, where she focused on pastry training. She then went back to Singapore and worked in a hotel there, furthering her training, and joined the Singapore National Team for pastry competition. Meaning she was really, really good at what she did. She was also married by then, and her husband's work kept him in Los Angeles, and the long distance thing was hard. Choo decided she needed to join her husband in L.A., and that was when she started thinking about opening a little place of her own. 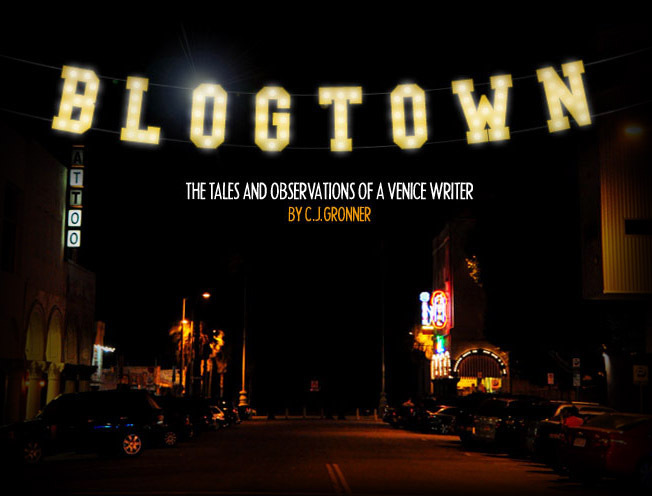 Driving around Venice one day, Choo saw the space recently vacated by The Hydrant Cafe was available on Abbot Kinney. It was a little cottage with a courtyard, just about the perfect size for what she had been envisioning. Venice was also perfect, in her feeling, as she explains, "I liked the FEEL of Venice. It wasn't pretentious, people are comfortable with themselves here." Exactly. Choo started the process from scratch (like her pastries), knowing nothing about the ins and outs of starting her own business, and she did it all herself, with no help. After the usual rigmarole with city inspectors, permits, suppliers and the like ("Crazy! "), Choo opened for business in September 2003, and has been blowing our minds with her concoctions ever since. It kind of amazes me that even many people that live right in the neighborhood have never been to Jin (named after Choo's own middle name). It IS kind of hidden behind its tall gate, and you have to walk through the garden, past the cherry blossoms, to get into the little house where all the treasures are displayed, but it is just truly not to be missed. Jin serves exotic and wonderful teas, little tea sandwiches and quiches (lovely for birthdays or the shower type event) but the real masterpieces are the desserts. Choo originally wanted to only do desserts, but after learning the local needs/wants/habits, decided to give people the choice of savory before diving right into the sweet. If they want. Many of us have no problem skipping right ahead to the sweet bliss, all made right there in the Jin kitchen. Like - our number one favorite - Sea Salt Caramels. There is also a cake called "Inspiration" that is a sea salt chocolate caramel dream. The macarons are too much - brightly colored little rounds of melting in your mouth deliciousness (again, get the sea salt caramel one of those too!). The artistic chocolates (packaged so beautifully you don't want to open the box) are ridiculous - lavender, mango-basil, yuzu, cinnamon, Earl Grey, passion fruit, lychee, each better than the next - and are perhaps the best possible hostess gift ever. No one will ever be mad at receiving a box from Jin, I assure you. The amount of bags from Jin cruising up and down Abbot Kinney on Valentine's Day this year made it clear that the local people know what's up for impressing their loved ones. Likewise, Choo's chocolate Easter eggs are flawless works of art that I like to just stare at each year. Remarkable. There was a Jin location for a while in Century City in the Intercontinental Hotel (closed last year), and a Valentine collaboration with Japanese department stores, but Choo is most happy in her little house in Venice, welcoming the locals and tourists alike who share her love for the original qualities of our town. She likes that her shop is unique, that people can only get her creations here in Venice. How lucky we are! Choo hopes that Venice "won't be like other places. Venice is a precious part of Los Angeles. Everywhere else people look the same, here they have PERSONALITY." Now that Choo and her husband have a child, she doesn't get the time to enjoy Venice as much, but has noticed all the changes taking place along Abbot Kinney, like we all have. She can't stand First Fridays (again, like most of us nowadays), and really prefers the older school way things were (ditto). But, also like most of us feel, the personality of place really outshines all the rest, and Choo's local regulars are now her friends. She can't picture her little chocolate factory anywhere else. She loves it here. We love having her here. Try this ... maybe you're having a little challenge of some sort. Go to Jin. Pick out something, anything from the pastry or chocolate case. Take it with you down to the beach. Look out over the horizon. Let the breeze wash over you and the sweet dissolve in your mouth. Even if just for that moment, everything will be so much better. It really is about the simple pleasures in life. And Jin has them for you in abundance. I'm not sure what's in retrograde or rising or whatnot, but it seems like there have been a LOT of major peAKS!!!!! and mega VALleys...., back to back, for myself - and most everyone I've talked to lately. This morning's blustery walk on the beach (we laughed it was like free micro-dermabrasion) was a good real-life analogy of whatever's going on. It was SO beautiful out after yesterday's rain, just crisp and blue and diamonds on the soles of our bare feet, both sand and water. We sat down on the lifeguard tower for our water break and I started to complain about how it had taken me two days to get tar off my feet from the other day, with rough scrubbing. Filthy stuff. I looked down at my feet and thought I saw another tar blob, but nope, it was a bright little ladybug! Awesome. I saw a couple ladies taking turns taking pictures of each other, so went over and offered to take one of the two of them together. You would've thought I'd offered them the rare kind of bone marrow they needed. Is doing a stranger a decent turn really that rare these days? Let's hope not. Resuming our blowing down the beach, I saw a dead looking little fish. Jenny picked him or her up and threw 'em back in the water, with revival hopes, but more likely to sleep with other fishes. Kind of sad. Then walking along some more, I almost stepped on a purple starfish! Right there, washed up on the sand! We've seen a lot of them lately on the jetties (amazing every time! ), but not solo on the sand. It seemed to still be malleable and maybe had just been flipped out by the crazy eddies from the wind. The starfish also got tossed back in the waves, with higher hopes of recovery. And WE had higher hopes, that our eco-system is hanging in there and these creatures are there for us to see (and save!) every day. What a cool thing. Not 50 yards later, something caught my eye in the waves. One of the big beach garbage cans had been blown out into the water and was bobbing up and down in the whitewash, like a poster for awful urban pollution. We stopped and just stared at it, feeling bummed and quiet after our high spirits two seconds earlier. As we stood there and wondered what to do, a guy came running up and said, "Will you toss my towel up on the dry sand, I'm gonna go get that thing!" And he did. He waded out there (Far. We only got the camera out once he was coming in) and wrestled with this bigass garbage can in the shore break, and brought it in! An Eco-Hero! He should tie his towel around his shoulders like a cape! His name was Richard, and when I thanked him so much for doing that, he said, "Oh, I've been chasing barrels my whole life!" Rad. Our spirits soared again, just to know that there remains some people who do a good thing just for the sake of doing it. And it was all another in your face reminder about how we're all in this whole deal together, right down to the spineless little guys that are our sea neighbors. I hope it all mellows out for everyone pretty soon here, but on the other hand, it's never a dull moment this way, so ... I guess just get out there and see what happens! And try to be good. Ahhh, remember this ol' GEM? Happy Valentine's Day, indeed! Let's try to remember to love the best we can every day. It really is what the world needs now. Everysingleone does. I bumped into my friend Gallo yesterday morning at the beach, and he told me about his friend Karim's film screening at Beyond Baroque last night. 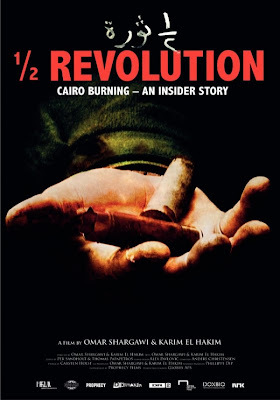 1/2 Revolution is the heavy, dramatic, REAL documentary of a group of friends as they experience the (ongoing) Revolution in Cairo - exactly one year ago. Titled HALF Revolution as it is nowhere near over. The film just screened at Sundance, and is especially timely because 75 people were just killed at a soccer match in Egypt by government thugs the other day, and Tahrir Square is on the front page of today's paper again, full of fury, pride and resistance. The people of Egypt MEAN it. I was happy to see the screening room at Beyond Baroque packed at 10 pm on a Thursday, full of interested, caring Venetians and friends. Egyptian born Karim El Hakim lived in Venice for years, until 9/11 happened and he no longer wanted to participate in the politics and economy of the U.S. He moved back to his homeland, and has been right in the thick of the uprising in Cairo. So much so that he filmed much of it right outside the window of his home. It's all about basic human rights. Which is exactly why it's so universally compelling, and why the spirit of the whole thing is catching on - everywhere. The People of Egypt were FED UP with the 30 year Mubarak regime, and took to the streets. Watching it all on the news, it's difficult to grasp how very BIG it all was/is. When you see it up close, through the lens of a regular guy that many in the room hold dear as a friend, it is entirely something else. You feel the fear, the panic, the righteous anger, but most of all, you feel the absolute determination of a people that are ready not just to protest, but to die for a better way of life. As one guy says, "If I die, I die with a smile." "Everyone is on the streets - EVERYONE! ", yells Karim into the phone to his friend. You feel the terror when friends lose each other in the melee, and the joy when Karim is reunited safely with his wife on the street. Super moving (His wife called during the Q&A following the film and the entire audience applauded her via speaker phone). You feel the fury and pride when a fellow citizen is killed by their own government, and someone writes "Egyptian" in their blood left on the street. This is especially outrageous as the entire time the people protesting are yelling, "NO VIOLENCE!" What must happen in the minds of authorities/leaders to make the slaughter of people they are meant to protect permissible by their hands? A deep sickness, no question. 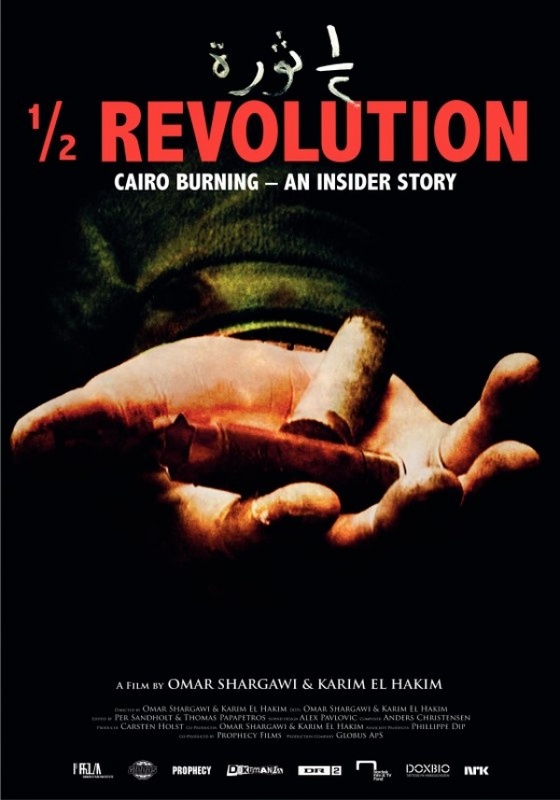 El Hakim and his director, Omar Shargawi, take you right into the dead center of the thrill and fright of the packed Tahrir Square, and back into their homes as they deal with the reality of those intense days. El Hakim is leaving tonight to return home to Cairo, and will be back on the streets with his people tomorrow. "Nothing has really changed, Egypt is a mess," said El Hakim in the Q&A. 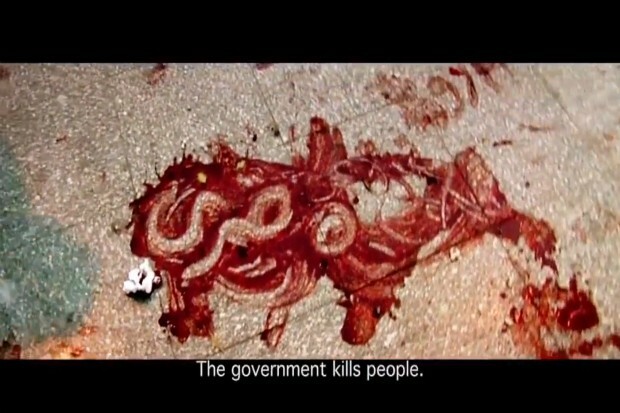 "This is not Occupy Wall Street, people are dying in the street." Gerry Fialka asked him why he lives in Cairo now, and El Hakim responded, "I feel like I live in the future there ... as the U.S. and others follow our example." But he cautioned, "If you're gonna move, be ready." You can just watch this film and know exactly what he means. And I hope you will. 1/2 Revolution is doing the festival circuit now, but keep your eyes open for screenings anywhere you can via their website. It is a MUST see documentary for oppressed citizens of the world everywhere. As the Egyptians chant, "FREEDOM!!!" "JOIN US!!!"